Our broad portfolio of materials enables manufacturers of medical devices, fabrics and packaging to design for the future, developing new, innovative options that perform better than what was available before. Plastics used in medical products are under increasing scrutiny with tightening standards and restrictions. Governing bodies around the world are acutely focused on creating stricter regulations about the quantity of chemicals escaping from plastics – particularly where the plastics come in contact with drugs. DSM is the world’s leading developer and manufacturing partner of materials for medical devices. Medical device manufacturers use our engineering capabilities, and our ability to deliver customized material solutions, to help them get their products to market quickly. Our broad portfolio of materials enables manufacturers of medical devices, fabrics and packaging to design for the future, developing new, innovative options that perform better than what was available before. Whether it’s surgical fabrics that help control the spread of bacterial and viral infections, medical packaging that maintains sterile instruments, or drug delivery devices that don’t leach, our team works to create solutions that work to constantly improve the standard of care. Arnitel® TPC allows for very sustainable solutions, since it is PFC free and 100% recyclable; Arnitel® TPC allows for very comfortable and reliable solutions due to its high breathability and 100% waterproof performance under all circumstances (unlike perforated membranes) and since it forms a 100% barrier against fluids, bacteria and even viruses. Gowns and drapes are the first line of protection for medical staff and patients against bacterial and viral infections. However, research shows that 1 of 10 hospitalized patients will acquire an infection after admission. 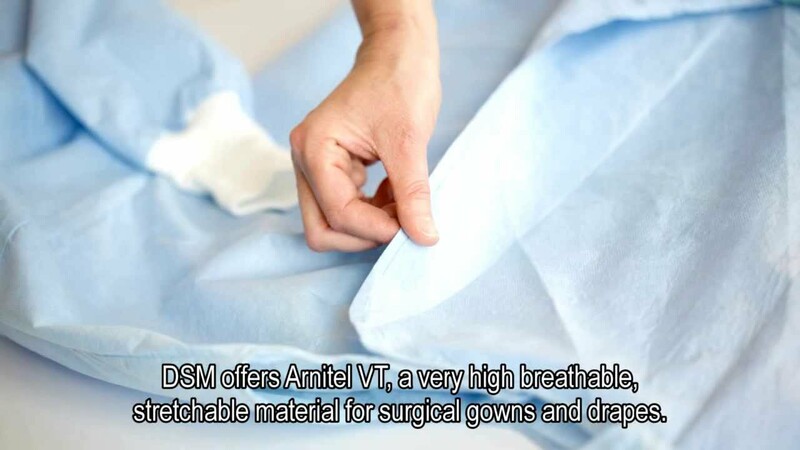 Arnitel® VT is based on unique monolithic technology that makes material breathable and flexible without the need for thousands of tiny holes. Offering a 100% barrier to bacteria and viruses. In the ongoing quest to do more with less, some automotive applications prove more challenging than others. Once you are ready to commercialize your part, you also need to ensure it complies with relevant industry standards and regulations.